On the site at 81-87 Madison street, where the work of wrecking the old buildings was begun last week, the first section of the great new structure for the use of the Boston store will be erected. The property from State street to Dearborn, on the north side of Madison and extending to the alley half way to Washington, is owned or controlled by Mrs. Mollie Netcher, widow of Charles Netcher. On this, one section at a time, a fourteen story building will be put up. A great amount of space below the street level is to be utilized in the new structure. First there will be the regular basement, 15 feet in the clear, which Is to bo devoted to salesrooms, then a second basement with a 12 foot ceiling for shipping rooms, and last, a third basement, the bottom of which will be 7 feet below the tunnel. Here will be placed the machinery of the great plant. The exterior of the building Is designed to give a maximum of light, thus making unusually desirable salesrooms. For two stories the outer walls will be gray granite. Above thIs they will be of light gray glazed terra cotta. In addition to the thirty-four passenger elevators to carry patrons of the store from one floor to another, a novel feature will be added, in the Introduction of moving stairways, extending from the basement to the fifth floor. These will carry 20,000 persons. At 5:30 o clock this afternoon Chicago will lose one of its older business establishments when the Boston store, at the “world’s busiest corner,” Madison and State sts., closes its doors to the public for the last time. 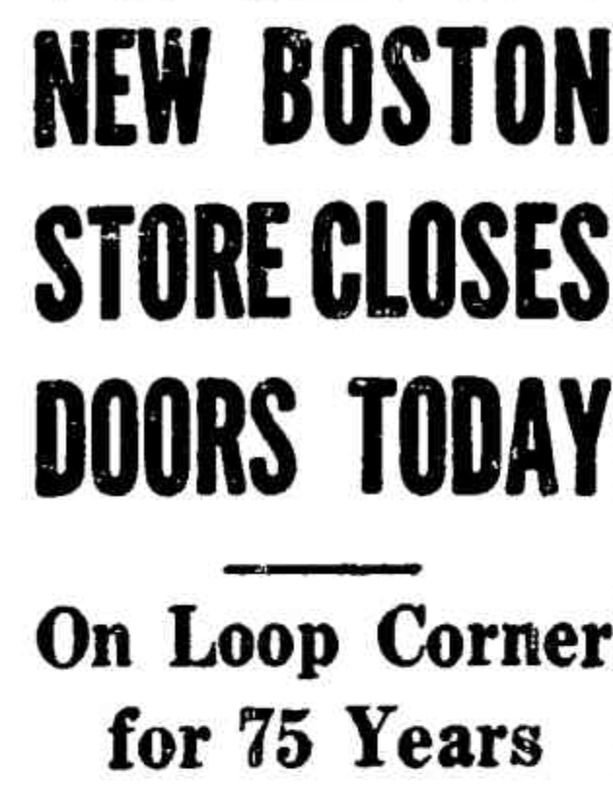 Today’s closing—the end of a month’s liquidation sale-comes 75 years after the Boston store began business as a product of the reconstruction period following the disastrous Chicago fire of 1871. All that remain for the complete demise of this State st. department store are the disposal at wholesale auction of left-over merchandise and the sale of fixtures. The 17 story structure, on the northwest corner of the famous business intersection then will be transformed into a combination and store building. 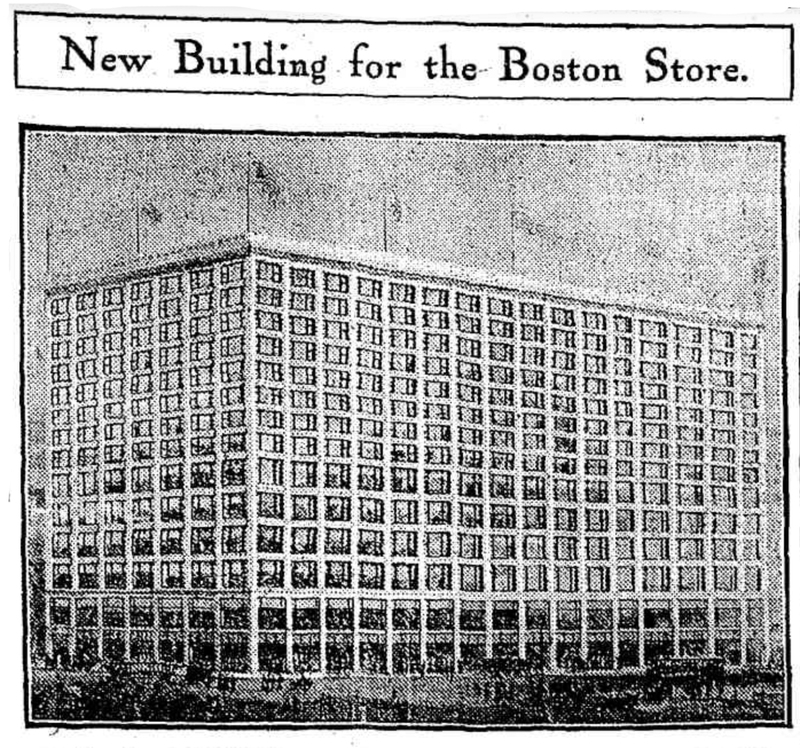 The passing of the Boston store represents the first major break in the big State st. department store line-up in years. The Boston store itself caused the last big change by buying the stock of the Siegal-Cooper company 30 years acts. The man responsible for making, the Boston store a major operator on State st. was Charles Netcher, whose career followed the traditional Horatic Alger pattern. In 1865 young Netcher was earning $1.50 a week carrying bundles for a Buffalo, N.Y., store operated. by Charles and Edward Partridge. with Netcher’s work in that and subsequent jobs. 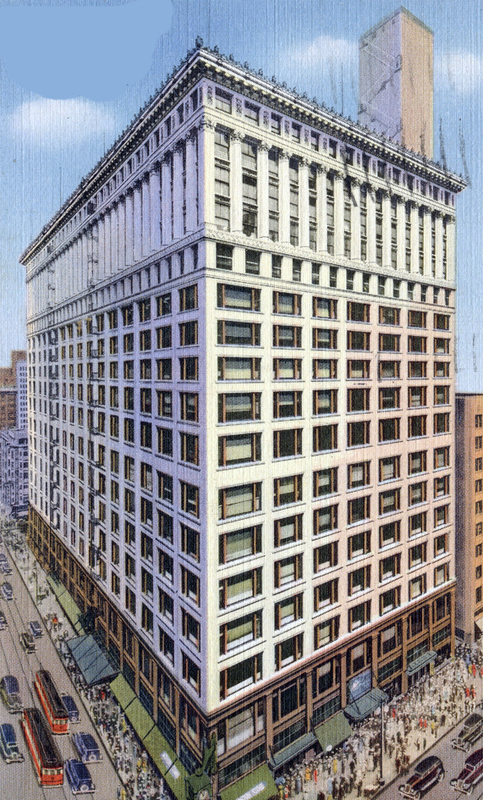 The Partridges brought him to Chicago in 1873 when they opened a store in a three story building on part of the ground occupied by the present Boston Store. Netcher was installed as manager, and within five years of the store s founding he had bought out the Partridges’ interest. He operated the store until his death In 1904, when it was taken over by his wife, now Mrs. Mollie Netcher Newbury. Two years ago the store and property were purchased by a syndicate headed by Edgar L. Echnaaig for about 14 million dollars. At that time the name was changed to the New Boston store, altho in the minds of most Chicagoans the original title applied. Earlier this summer control passed to a banking group which exercised a right to convert $5.268,750 of New Boston store notes into stock. Previously a contemplated stock issue to cover the notes failed to materialize after it was decided that the securities market was unfavorable for the offering. Shortly after the banking group took over it became known in business circles that the group wished to sell because it did not consider itself equipped to operate a department store. For a short period, it was believed a new department store operator might purchase the business. The banking group, which is headed by Union Securities corporation, is attempting to sell the building and property. The Boston store once had the second highest annual sales record on State st. That was in 1923 when sales totaled 33 million dollars. Later the sales volume began to shrink. The war was said to have brought only a brief respite. The liquidation sale, began 30 days ago, is believed to have brought back many old customers for final bargains, Cashiers reported that silver dollars and old sized bills showed up in the tills as many a gray haired couple strolled along the sale counters. it was estimated that 4 million worth of stock will have been cleared by closing time In the final sale to the public. Florsheim Shoe company will open a new store today’ at 1 N. Dearborn st. The site Is a corner section of the old Boston Store building and has a frontage of 60 feet on Dearborn at. and 25 feet on Madison. The store front is of modern visual design with no conventional dIsplay windows. All merchandise on display is shown in moveable glass cases inside the store. Interior walls are of red brick and dark Tennessee oak, with bleached oak furniture and fixtures for contrast.